As a part of Cycle September, join us this Thursday, September 20 at 12pm for Cycle with a Doc! Have you ever wondered about those blue bikes everyone is riding around the city? Join Dr. Cheryl Bettigole, family physician and Get Healthy Philly Director, for this event. The Bicycle Coalition of Greater Philadelphia and the Better Bike Share Partnership will provide a special Urban Riding Basics class that will give you the knowledge to bike safely and confidently in Philadelphia. 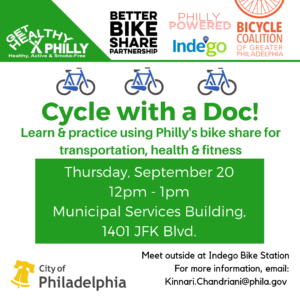 Learn about riding safely, rules of the road, choosing a route, and how to use Indego (Philly’s bike share program). No bike needed. At the end of the session, you will have a chance to test ride an Indego bike!